Make the dressing by placing all the dressing ingredients into a blender and blend until completely smooth, about 1-2 minutes (be sure to take the dates out of the water and take the pit out if they have one, before adding them to the blender). 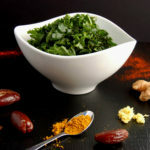 Place the chopped kale into a large bowl and pour the dressing over it. Massage with your hands for a minute or so, making sure the dressing is thoroughly incorporated into the kale.